First up is my crochet Cthulhu Toque, which began to take shape in my mind in late 2008, but was not fully ready and released until spring of 2009. One of my favorite things to knit or crochet is hats, and after being inspired by a Â Cthulhu amigurumi, I decided to test my pattern-making ability and design a toque with tentacles. After a couple attempts and sizing tests on my husband, I finally felt like I had come up with a design I was happy with, and my Cthulhu Toque was born. Back at the time, there were no crochet Cthulhu toques like it. There were fleece toques with tentacles or knitted beanies with a fair-isle Cthulhu pattern around the band or full-on crocheted Cthulhu face masks that covered the entire head and transformed the wearer into Cthulhu, but nothing quite like mine, with Cthulhu on top. It’s still my best seller, even seven new Cthulhu designs later! It’s made from soft, washable acrylic and features button eyes. 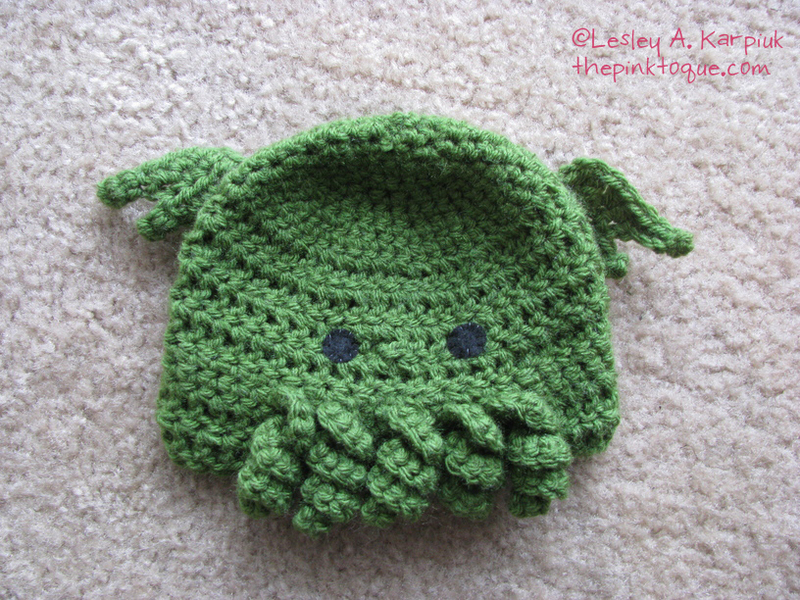 I’m sure it comes as no surprise that I got a lot of requests for a baby and/or child version of the Cthulhu toque over the years. 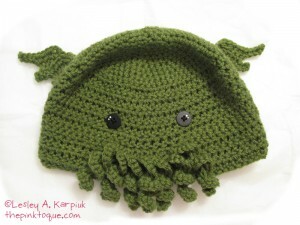 I finally put one together and released a Baby Cthulhu Toque, too. The model for my first trial run of the baby design was timed well with the birth of my nephew, who tried hard to fight the brain suckage. There’s not many things cuter than a baby wearing an evil toque. The baby version is also made from the same soft, washable acrylic, but I omit buttons for eyes and instead stitch on felt eyes for safety reasons. Back before I learned to knit and crochet, I made a lot of plush creations. I spent nearly a year when I first moved to Canada waiting on immigration to give me a permanent resident card so that I was legal to work. During that year, I instead learned how to sew and bought a sewing machine to keep from going crazy. I made a lot of purses and plushies, including several sock monkeys. After my Cthulhu Toque took off, I sat down one day and drew up how I would make a Cthulhu “sock monkey” using some fuzzy chenille socks I had. The Sock-Thulhus that resulted were so adorable and popular, but I found it hard to find enough of the socks to keep up. I quickly sold the first set of Sock-Thulhus I made, and have yet to find a good way to keep a steady supply of “just the right socks” to continuously make more. 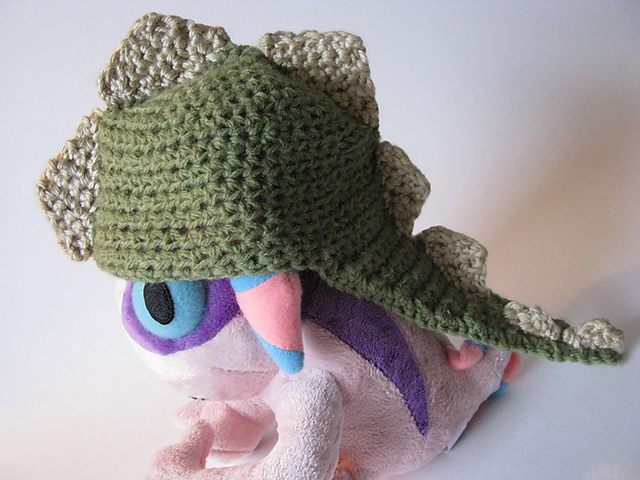 Instead, I think I see me writing up the sewing pattern and instructions someday and offering that instead, much like I offer the Cthulhu Toque pattern for crocheters. That way those who use the pattern can make a Sock-Thulhu from whatever socks they want. One day I’ll get that pattern put together! While most of my Cthulhu creations are crochet, I also have a geeky soap business called GEEKSOAP, and of course Cthulhu found his way into my soapmaking. While I had made a few bars of Batman soap which were technically the first bars of GEEKSOAP ever made, Cthulhu was what inspired GEEKSOAP to grow into a small business featuring a wide variety of geeky themed designs, and was the first set of soap I offered for sale under the GEEKSOAP name. In late 2009 on Etsy I released the first Cthulhu soap before I moved GEEKSOAP to its own storefront. 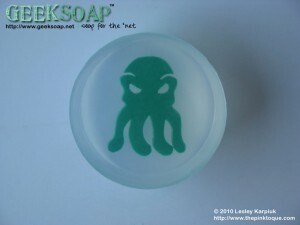 When GEEKSOAP.net opened up separate from Etsy in early 2010, it came with a newly re-designed (and better) version of the Cthulhu soap. 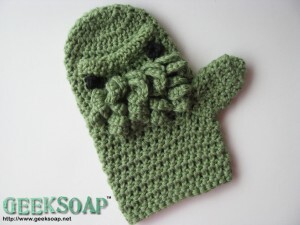 Soap inspired my next Cthulhu-theme design, which is also sold over on GEEKSOAP.net – my Baththulhu Cthulhu Bath Mitt! 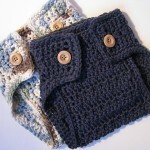 I am so in love with the expression of this super soft, 100% cotton bath mitt creation. It pairs well with the soap, don’t you think? I wrote up the pattern and released the one and only Cthulhu bath mitt in mid 2010 and it has gone over really, really well! 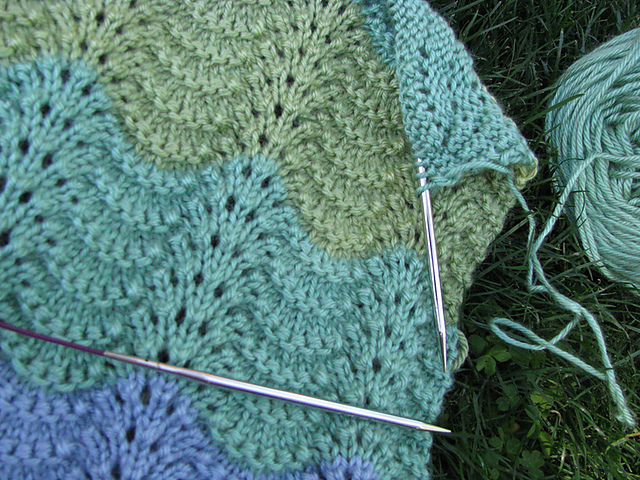 I currently make a right or left handed version in both one-size-fits-most and an extra long one. The tentacles are great for working up a good lather and acting as a loofah-like scrubbing surface. Next on the list is a scarf design! Towards the end of 2010 came the Scarfthulhu Cthulhu Scarf. 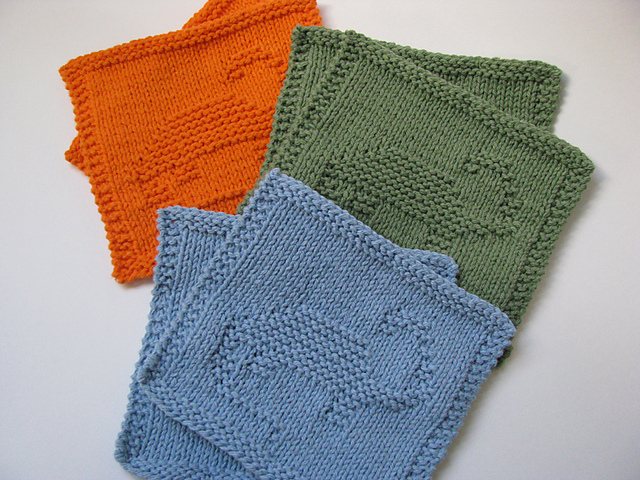 I like how the faces at either end remind me of my Cthulhu toque; together the scarf and toque make a great matching set! The scarf runs approximately 63 inches long; that’s over 5 feet of pure awesome to wrap around your neck on a cold, winter’s day. Just like the toque, the scarf is made of a soft, washable acrylic. 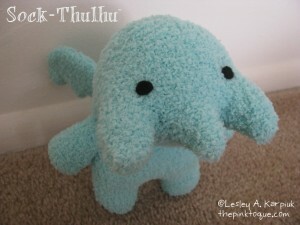 Like the little Cthulhu plush model in the photo? He was made by Ruth, and you know you want one! 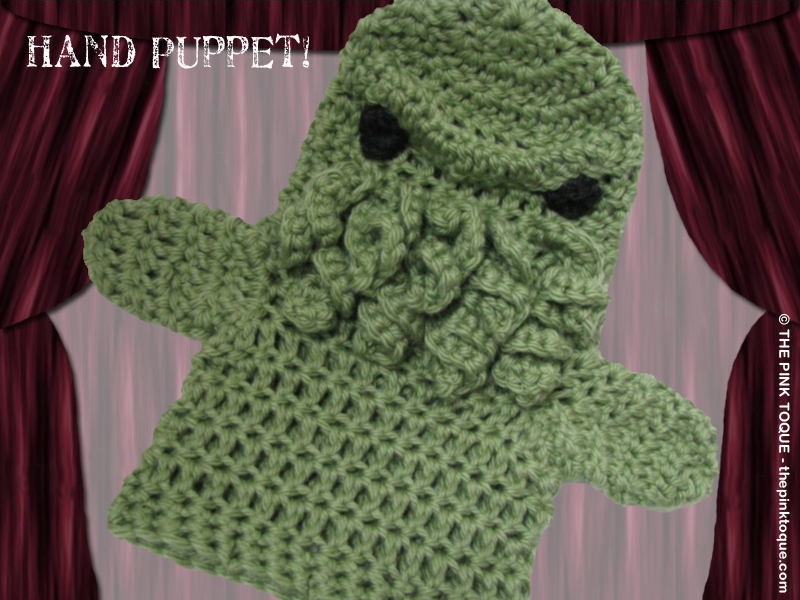 In early 2011, a crafty friend of mine was expecting her first child and asked me if I would modify my bath mitt pattern to create a custom Cthulhu puppet for her to play with her baby. With a little work, I then released Puppethulhu, a crochet Cthulhu puppet. Similar to the bath mitt, and also made from soft cotton and featuring the bath mitt’s expression, the puppet features two “arms” instead of just the one thumb opening of a mitt so that the wearer can manipulate both arms like a puppet. She loved this so much and it went over so well when I shared it with the masses that I also made it available in my shop for others. 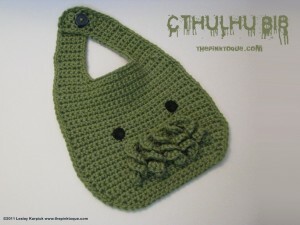 And speaking of babies, I am expecting MY first child in June 2011, and so I decided to whip up a crochet Cthulhu bib for my geekling this past weekend. While not the first Cthulhu bib in existence or anything, I wanted my bib to have the same look to it that would match the style of all of my previous crochet Cthulhu designs. I really love how it turned out! It took four (horrible) attempts to get the bib shape just how I pictured it with the telltale tentacles and wide-set eyes that I like to do. Every baby needs at least ONE evil bib, right? And those tentacles would be happy to catch any dropped food for you, too. 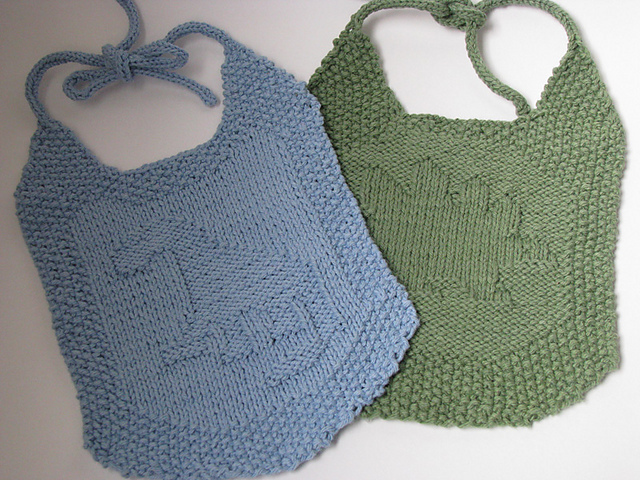 The bib is also made from soft 100% cotton for easy washing, but I haven’t decided yet if I plan to sell the bibs individually over in the shop or if I should write up the pattern and offer that instead. 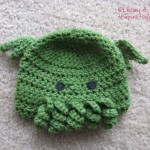 All of my Cthulhu goodies can be found at The Pink Toque Shop, with the exception of the Cthulhu Soap and Baththulhu Cthulhu Bath Mitt, which are over at my other shop, GEEKSOAP. Thanks for stopping by and checking out my collection of tentacled goodness! If you’re looking for even more Cthulhu cuteness, as I mentioned, you just have to go check out my friend Ruth’s plush Cthulhus over at CthulhuChick. She makes Cthulhu plushies with a lot of love, and as a personal owner of no less than three of Ruth’s Cthulhus that I keep in various places in my home, (including a baby one for my geekling in the nursery!) I can testify for their evil yet adorable awesomeness. You really do need one. The first week of March I began the first of many geekling knit and crochet projects that I had slated to make for our little boy due in June. Here it is the end of April and with just 9 weeks left before it’s go time, I thought I’d share all of the things I’ve made so far and what I have left to work on. Something exciting to note is that Ravelry, the hugely popular knit & crochet community, has made it possible for users to share their project pages by allowing us to make our projects public. The links below for each project I’ve made will take you to my Ravelry project page for it, where you can get all of the details… including the pattern name I used, who wrote the pattern, what yarn and needles/hook I used, and more pictures and a more detailed description of the project. So cool! 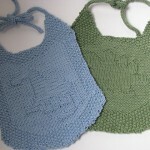 If you have any questions about any of the projects or patterns, do let me know. Here we go! For my first project, I started with the diaper covers that I mentioned in my previous post. Considering how warm Indiana summers are, I thought these cute covers would be better than pants over a diaper. They were super, super easy to make, too! You could easily get 2, maybe even 3 out of one skein of Lily Sugar ‘n’ Creme. Then you can get cute or fancy with your button choices to really dress it up. Next up was the dinosaur toque. 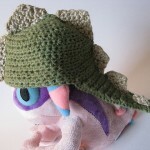 Our “theme” for the nursery is dinosaurs, so I whipped up a cute crocheted dinosaur hat for our newborn. Yes, it is being modeled by a pink plush Murloc in this photo. Try not to squee too loudly. I used a slightly lighter yarn for this toque than the pattern called for and have since picked up some worsted weight yarn instead.Â I am a little worried the hat will be too small because of the lighter yarn, so I may go back and re-make this toque using worsted weight just to be on the safe side. We have been generously given a photography session with Rachel Vanoven as a baby shower gift from our dear friend Laura, and I’d love to have the dino hat in at least one of the photos. Better make sure it fits, eh! 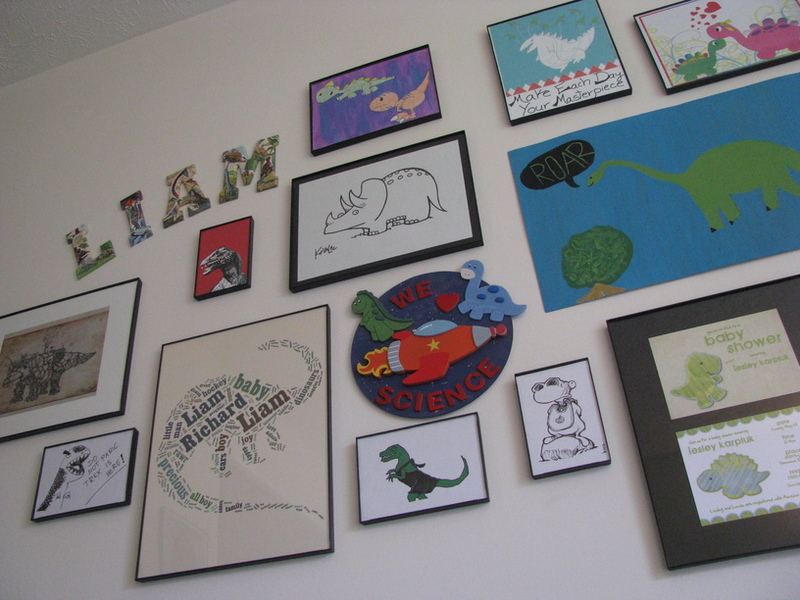 I then had fun making a couple dinosaur bibs – one each of a stegosaurus and a bronto/apatosaurus/brachiosaurus looking dino. While I’m not crazy about the whole tying part (in hindsight, I should’ve modified the pattern to snap in the back or velcro instead), I have come to the realization that these won’t be used all the time and are more about cute than being super easy to use. I’ll use them for sure, (being 100% cotton means they’ll be easy to clean at least!) but I have a feeling that more practical bibs will get used more often. 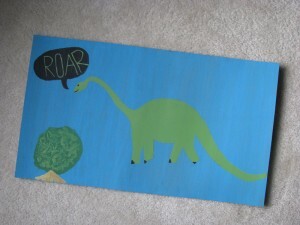 After the bibs, I spent a week or two cranking out a half dozen dinosaur burp cloths. These will be so handy! They, too, are made from 100% cotton to make them durable and easy to wash. All six of the cloths are of the Brachiosaurus variety. I can see having these stuffed in a diaper bag and using them for everyday baby messes around the house or on the go. These were really easy to make, and after the first few, I really got in a groove with them and could crank one out in an evening. If I find time, I may go back to making a few more of these before the geekling arrives; you can never have too many cloths with a baby around. 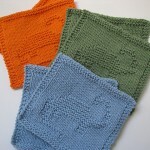 The most recent project isn’t dinosaur themed, but is a staple for any new baby: a baby blanket. I went with a familiar pattern that I used for my nephew’s baby blanket two years ago, but this time I alternated colors reminiscent of the ocean and called it the Ocean Fade Baby Blanket. The feather and fan openwork pattern naturally made these beautiful ripples in the design that looked great in these colors, just like the ocean. Fitting, since I started the project on our roadtrip to Savannah, GA where we spent some time on the river and then on the ocean at Tybee Island. We try to take one trip a year over our anniversary (June 20) where we end up in a bed and breakfast on the ocean, and this year because the geekling is due 9 days after our anniversary, we decided to make that trip a bit early and stayed in an oceanside bed and breakfast on Tybee over spring break instead. 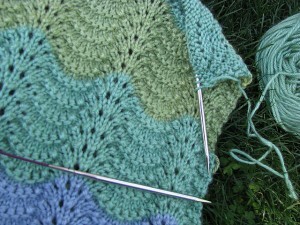 The other pictures of the blanket and me working on the blanket over on my Ravelry project page comes from our trip. At the time of this writing, I am about 95% finished with the blanket; I blocked it last night (this was the second blocking, actually… it was so long and I didn’t have a long enough place to block that I had to do it in two parts!) and I hope to find time to weave in all of the ends securely this week. Technically, the very first bar of GEEKSOAP (Batman) was created in May 2009 for my best friend’s birthday when I was living in Calgary. However, I didn’t get back into making soap and adding it to my Etsy store for purchase until the end of 2009, after I’d moved back to the states and gotten settled in. Back then, the few varieties of GEEKSOAP bars I made were small and made from expensive, yet not the best quality, soap base. I had a lot to learn. I did my homework, looked into better quality bases, and took tips and advice given to me by the amazing @KyleeLane, who is a magical soapmaker and has become a very dear friend. I was blown away by Kylee’s generosity along the way and am thankful for all of her support and advice, because she helped to make me a better soapmaker. When I set out with GEEKSOAP, my goal was to create one-of-a-kind soaps that you couldnâ€™t find anywhere else before me, and I succeeded with each bar I made. Today I continue to strive to make original soapy creations! I’ve learned A LOT, and today am proud to make soaps that not only look a million times better, but they’re made from better materials than I used back in the beginning when I first started out, too. 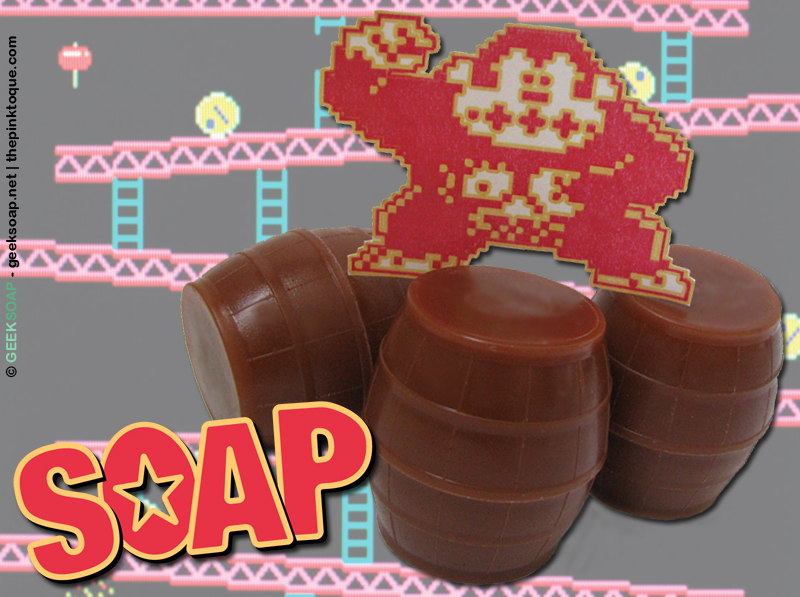 All bars are vegan friendly and hypo-allergenic and my custom molded bars (game cartridges, D20s on a Rope, Donkey Kong barrels, etc.) are not only 100% original, but they’re made from 100% all natural ingredients these days also. I’ve changed the way I make, color, and even wrap my soaps to provide a better overall product for my customers, who are the most important part of my business. Even my handmade labels have evolved along with my skills to better showcase the designs and ingredients inside. SO MUCH HAS CHANGED! Those of you who were with me in the very beginning on Etsy know where I started and how much GEEKSOAP has transformed. Thank you for supporting me. Back in the end of 2009 when I was selling on Etsy, I was selling my soap alongside my textile handmade goods like crochet Cthulhu hats. 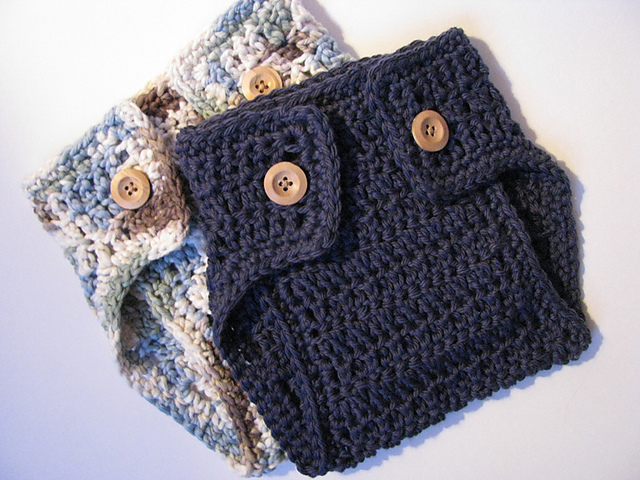 My Etsy had always been a bit of a hodge-podge of handmade goods, and has seen a large variety of products over the past 5 years… from purses and pouches that I sewed, to knit products, patterns, and crochet goodies. Then soap. Sales were slow at first, but after several big features of my D20 Soap on a Rope design (including a nod & linkage from the official Wizards of the Coast site!) which made my Etsy explode in early 2010 to the point that I couldn’t keep up because they kept selling out faster than I could relist, I realized that my soap really needed to be separate from my random fibre goods. I needed a new place to sell so that I could really focus and develop all of the geeky soap ideas I had in one place, with a name that made sense. I had been referring to the soap on Etsy as “GEEKSOAP”, so on February 23, 2010 I registeredÂ geeksoap.net and began promoting it as its own brand via BigCartel. The rest is history. Technically GEEKSOAP has been around longer than a year, but I consider today to be its anniversary since I didn’t separate GEEKSOAP from my fibre crafts and recognize it as its own brand in its own store until then, one year ago today. In celebration of this milestone and ALL of the amazing changes that have taken place over the past year to make GEEKSOAP better and better (and still striving to improve all the time!) 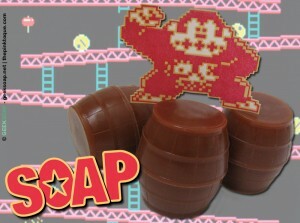 I want to offer a special promotion code for the week â€“ CELEBRATE used at checkout over on geeksoap.net will take 30% off your entire order! I can’t thank my customers and supporters enough for EVERYTHING this past year. Lots of love, advice, suggestions, AND constructive feedback has helped me do things better and make better things. I admit I’ve made mistakes (especially when I was first starting out) and I’m not perfect or even close to it, but because of your support I’ve been able to learn fromÂ mistakes and create a better product over the past year. We had an astronomically successful holiday sales season with so much positive feedback that I look forward to continuing successes! As if that wasn’t sappy enough for you, I also wanted to express my most sincere gratitude to ALL of you for your love and support the past few weeks. A lot of you know my husband spent a week in the hospital, and the unknown and then waiting for answers was hard! You guys were there for us when it was scary, and you were still there to celebrate with us when they figured out what was wrong. You’ve still been there for us as he’s been recovering, and we can’t thank you enough. Really. 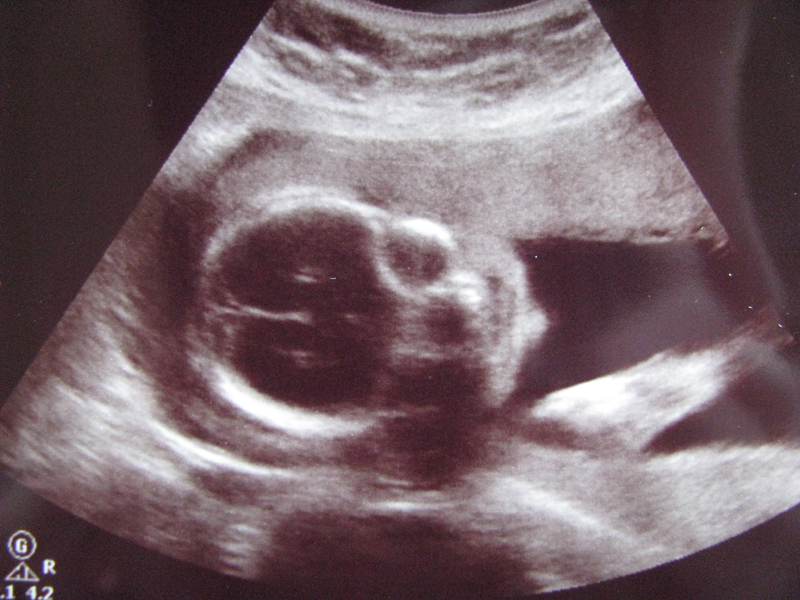 This week has Â been magical; Lucas is finally on the mend AND we found out our geekling on the way is a BOY! The outpouring of love and congratulations we received was jaw dropping. 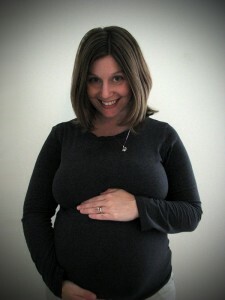 Not that this pregnant geek needs more reason to be emotional, but just know that your support has been so appreciated. Thank you from the bottom of our hearts! Buy a Soap, Save Boobies! Back in December, my boss asked me about breast cancer awareness soap and whether I could make her some that she could order to give to the team members of their annual Race for the Cure team that supports her mom, Ginny. I found a suitable mold from my supplier and made a few bars as an example. The team’s motto became “Clean Up for a Cure” with soapy inspiration. This week I registered to join Ginny’s Crew and help Clean Up for a Cure. Me and my 7 month pregnant belly will be proudly walking in the Komen Indy Race for the Cure in downtown Indianapolis on April 16, 2011. I’m doing all I can to help raise money for breast cancer research and education by inviting my friends and family to walk with us, and encouraging donations towards my personal sponsorship that goes towards the overall team goal for Ginny. 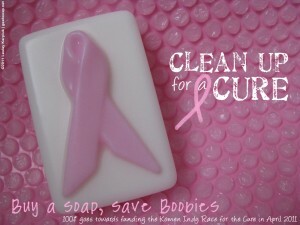 Starting this week I’m making the breast cancer awareness soaps available for sale at geeksoap.net, and you can buy one (or more!) between now and April 15, 2011.Â Purchasing a bar is a 100% direct donation towards our team fundraising goal just in time for the Race for the Cure. Follow our progress on my personal page at the Komen Indy Race for the Cure fundraising site. When you add a Clean Up for a Cure soap to your cart, you have the option to make your donation anonymousÂ OR you can choose to include your name with the donation. When these soaps are ordered, I will personally go and donate 100% of the soap purchase (all $10!) right to my Race for the Cure fundraising page, and either list your name as the donor (if specified) or list your donation anonymously – however you chose when checking out. And if you choose to have your name included, I will go by the default name on your Paypal account, though you can specify a Twitter handle or nickname in the notes to seller when checking out if you’d rather use that instead. You’ll be able to start seeing donor contributions listed on my Race for the Cure site within 24 hours of purchase. The best part? 75% of the money raised stays in Indiana for breast cancer education and research. The other 25% goes towards national breast cancer research and advocacy.Â Which means 100% of your donations are helping to end breast cancer forever! Please help me reach my personal goal, which helps Ginny’s Crew reach their team goal, which means more help in the battle against breast cancer. You can purchase a Clean Up for a Cure soap OR sponsor the team & I directly in the Race for the Cure this April if you’d like to specify a different amount. No donation amount is too small, and every penny counts! And if you’re local, why not register to come walk with us? We’d love to have you. The Clean Up for a Cure soaps are made fromÂ 100% all natural, vegan friendly ingredients. They weigh roughly 5oz, and are approximately 3″ x 2.5″. Each bar of soap smells of soothing, comforting lavender. Two Ways to Donate, Three Ways to Support! Buy Clean Up for a Cure Soaps – 100% of the soap purchase price ($10/each) is immediately put towards my fundraising goal. Sponsor me directly via my Race for the Cure fundraising page to specify a different donation dollar amount. Remember, no amount is too small, and every penny helps and is appreciated! Register to participate (walk, run, or sleep!) in the Komen Indy Race for the Cure on April 16, 2011. Thank you for supporting breast cancer research and our Clean Up for a Cure team – especially Ginny!